Chicken, Water sufficient for processing, Pea flour, Brown rice flour, Salt, Agar-agar, Ground flaxseed meal, Salmon oil (preserved with mixed tocopherols), Calcium carbonate, Sodium phosphate Chicken broth, Choline chloride, Tricalcium phosphate, Potassium chloride, Taurine, Zinc proteinate, Iron proteinate, Vitamin E supplement, Thiamine mononitrate, Niacin supplement, Calcium pantothenate, Copper proteinate, Biotin, Vitamin A supplement, Manganese proteinate, Sodium selenite, Riboflavin supplement, Vitamin B12 supplement, Pyridoxine hydrochloride, Calcium iodate, Vitamin D3 supplement, Folic acid. 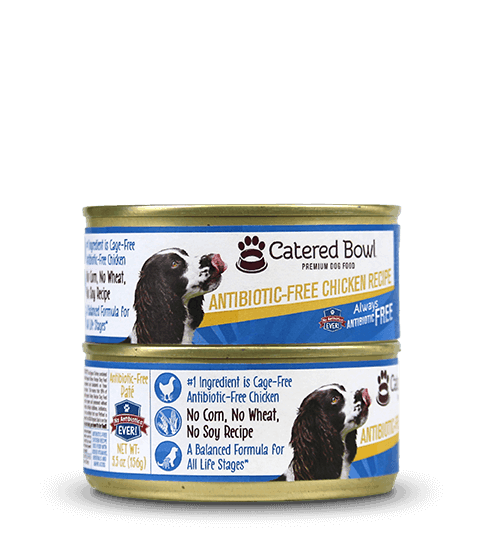 For adult dogs, feed 1 1/4 to 2 1/2 (13.2 oz) and 2 1/2 to 5 1/4 (5.5 oz) cans per day per each 20 pounds of body weight. For pregnant and nursing mothers and for puppies up to 1 year of age, feed up to 2 to 2.5 times as much as for adults of the same weight up to 7 cans per day. The amount of food your dog requires will depend on activity, age, environment and breeding status. Feed at room temperature and refrigerate unused portion in a sealed container. Remember to always keep fresh, clean drinking water available for your dog.